My working days are long, interesting, and often stressful. It’s hard on the brain. To refresh, most evenings I spend a little time playing music on the piano. It works. After a few minutes, my load has magically lifted. For as far back as I can remember, I thought that the piano was an amazing thing. On holidays when my older cousins play Chopsticks and Heart and Soul on my grandmother’s spinet, I was (in retrospect, ridiculously) transported. I looked so simple, a black box, quite plain, but it produced music. All you had to do was press some buttons. But I quickly learned, when I tried pressing the buttons, it was harder than it looked. Eventually I learned to play. In my less-than-perfect way, I’ve played the music of giants, running the genius of Chopin, Liszt, Debussy and many others straight into my head and out again, through my fingers, onto the keys, onto the strings, and into my ears, and sometimes the ears of friends. I learned the fundamentals of jazz and played the great songs of Kern, Gershwin, Berlin, and many others. Every Christmas, I play some carols and also some truly awful stuff that makes me smile, like The Christmas Song by Alvin and the Chipmunks. Another guilty pleasure for me is reading through transcriptions of Strauss waltzes and the marches of John Philip Sousa. It’s fun. Of course, as they say, there’s no accounting for taste, and to each his own. 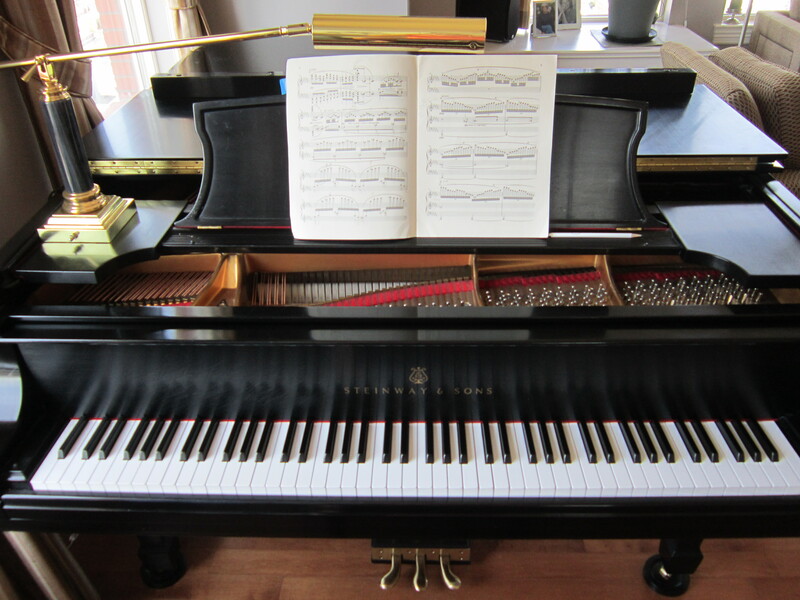 But the piano accommodates an amazing range of musical expression. If you can’t immediately find a musical collaborator who likes the music you care about, no problem. You can approximate a full orchestra, melody and harmony, soprano, alto, tenor, and bass, all by yourself. Why doesn’t everyone do it? This is the unfortunate thing: it’s a complicated skill and takes a considerable amount of time and effort to learn. In an age when we are accustomed to instant gratification, the gratification of playing the piano is highly delayed. You need to program your brain for several new skill sets. Reading music is a bit like reading a foreign language, which is hard enough, but you need to read it vertically, on two staffs, as well as horizontally. The sign system has many odd symbols, like sharps and flats, and double sharps and flats. You have to learn about meter and rhythm and tempo. You also have to learn bits of Italian, French, and German. All this is separate and apart from another big challenge: how to touch the right keys rather than the wrong ones. And even that is not the whole story. You can touch the right keys, but in the wrong way, and make sounds that resemble the music, but aren’t really it. In other words, making real music requires more than just playing the notes. It requires getting in touch in a deep way with what the music is, and learning how to translate thought and bodily energy into sound that in turn evokes feeling. Although learning all this was, in retrospect, an amazing challenge, I have to say, I always liked it. When I played beginner pieces, I thought they sounded good, and when I played intermediate student pieces, I thought they sounded good. Because they were at always just beyond the edge of the skills I had at the time, they were challenging and involving, and I felt a sense of accomplishment when I mastered them. So what might sound like a dreary journey actually had many wonderful episodes. So what is the secret to learning the piano? Everyone already knows part of it: you’ve got to practice. By practice, I mean a concentrated daily devotion to the musical problems before you. If you’re working, as I am at the moment, on Un Sospiro, a gorgeous piece by Liszt, you will need to use skills you’ve built over a period of years, and also some new skills that are not in your repertoire. For these, you need time in the workshop, like an inventor trying to solve a technical problem. It’s lonely work at times, but then there are satisfying breakthroughs. Practice means asking many questions: what is the the best way to play each note, each chord, each phrase, and all the phrases of the piece? The process is potentially endless. So if you understand the meaning of practice, how do you get yourself to do it? You need to start with a strong sense of purpose. It takes a full-hearted resolve. And then you need to figure out how to fit thirty minutes a day or so in for the work. And then, stay with it, week after week, month after month, year after year. Eventually, it becomes a habit. At that point, there’s a shift, and instead of being hard to do it, it’s hard not to do it. But it can’t be a mindless habit. You have to somehow keep it fresh and stay mentally engaged. This is a separate challenge, and for this you will almost certainly need a good teacher. As I noted in my last post, you should find a good teacher for any complex skill, but you’d be making a big mistake to invest a lot of energy into playing the piano without a teacher. You’d waste precious time and probably be so frustrated you’d ultimately give up. You always remember your first teacher. My first piano teacher, Mrs. McGee, had white hair, bad breath, and hands that were red and scaly, like lobster claws. I was 12 when I started with her. In her living room, where I waited for her to finish with the student ahead of me, she had a stack of Cosmopolitan magazines, which I perused with great interest. But eventually it would be time for the lesson. And I would learn something I never knew before. I have been reading your blog for a while now. I especially like your posts about Carolina Ballet. Even though you are big supporter of Carolina Ballet I thought you might be interested in a documentary I am making about North Carolina Dance Theatre. I am trying to raise finishing funds with a Kickstarter campaign. Even if you aren’t able to help out, perhaps you may know some like-minded individuals who support the arts in Charlotte that you could forward this link to? Thanks for the feedback. I checked out your kickstarter project and thought it looked really promising. I think film is really important to the future of ballet, and its potential has barely been explored. Good luck in getting your documentary done, and doing others, too.